Mexico just showed the first signs of its "contingency plan" to weather a Donald Trump presidency. To save the suffering Mexican peso, the central bank, known as Banxico, raised its key interest rate Thursday, citing the U.S. election as the main reason. "The view for the global economy became more complex, among other factors, as a consequence of the election process carried out in the United States and its result," Banxico officials said in a statement. Banxico raised interest rates 50 basis points, or 0.50%. Investors didn't think that was enough. The peso had been flat earlier in the day, but shortly after the announcement it was down 1% against the dollar. "The markets were expecting somewhat more," said Carlos Serrano, chief Mexican economist at BBVA. Central bank officials also cited Trump's victory as the main reason behind volatility in stock markets. Mexico's IPC stock market is down 6% since the start of November. Trump says that on Day 1 of his presidency, he wants to start renegotiating, or withdrawing, from NAFTA, the trade deal between Mexico, Canada and the United States. 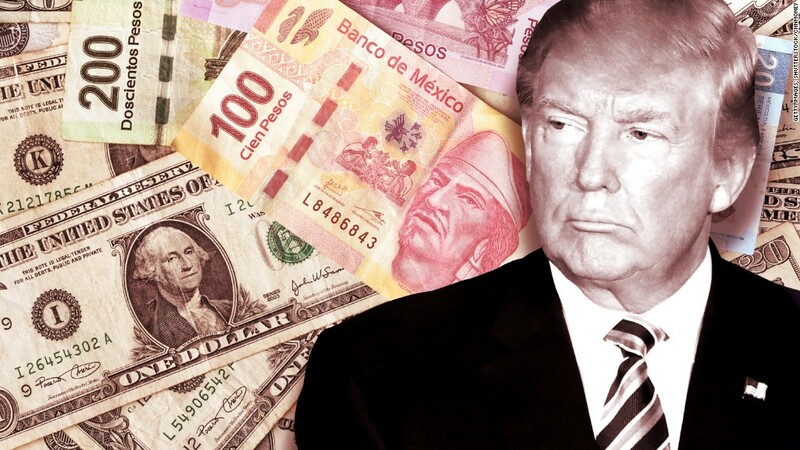 Tearing up NAFTA would badly hurt Mexico's economy, experts believe, and such threats are a key reason why Mexico's peso has lost 15% of its value against the dollar so far this year. Trump has also threatened to slap a 35% tariff on goods made in Mexico and sold in the United States. And he wants Mexico to pay for a wall along the U.S.-Mexico border. Trump hinted that he might tax remittances sent to Mexico to pay for the wall. Download CNN MoneyStream and don't miss the news! Mexico's central bank governor, Agustin Carstens, tried to calm Mexicans and investors before the election, saying he and Mexico's finance minister, Jose Antonio Meade, had a "contingency plan" in place if Trump were elected. But when Trump won, Mexico's peso crashed to an all-time low and Mexican officials did not unveil any actions. Carstens' decision to raise rates Thursday was Mexico's first attempt to brace for Trump's presidency, something Carstens called a potential "hurricane" before the election.